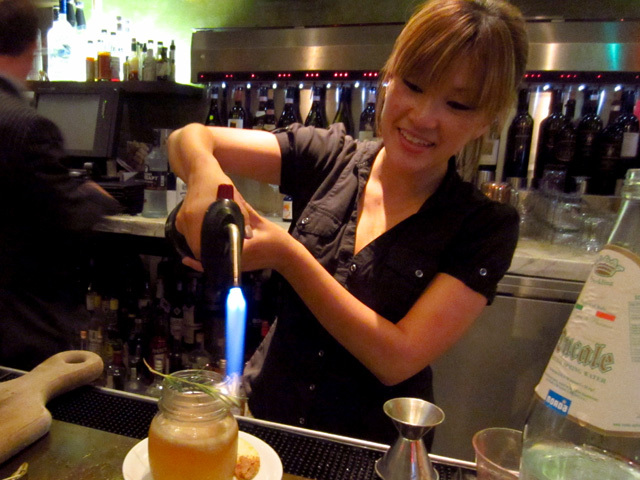 It’s been quite a summer for Drago Centro bar manager Jaymee Mandeville, from the Lil’ Twisted Sangrita Tour she embarked on with Cari Hah (Neat) to her acceptance in the Tales of the Cocktail Apprentice Program. Two weeks ago, she survived attended the bourbon-soaked Camp Runamok summer camp along with a select group of bartenders from around the country. 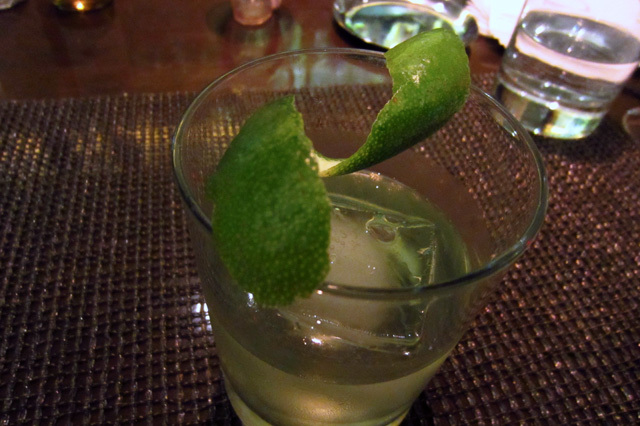 Back on her home turf, Mandeville recently hosted a preview of the new Drago Centro Fall Cocktail Menu, which not only features her signature balanced and wide-ranging originals, but includes several new spirits releases that are capturing the attention of cocktail aficionados. 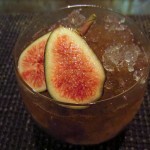 On Wednesday, October 3rd, Drago Centro will celebrate Mandeville’s new seasonal cocktail list by offering the fall cocktails (normally priced at $12) for $8 each. As always, the all-day happy hour menu of bar bites will be available to pair with the signature libations. First up was the Autumn’s Deluge, made with Karlsson’s Vodka, Breckenridge Bitters, lemon, white grapes, arugula and prosecco. Mandeville has been a longtime supporter of the Karlsson’s, using it here in a bright, refreshing drink that anticipates rainy days ahead while giving a nod to the summertime temps that are still with us. 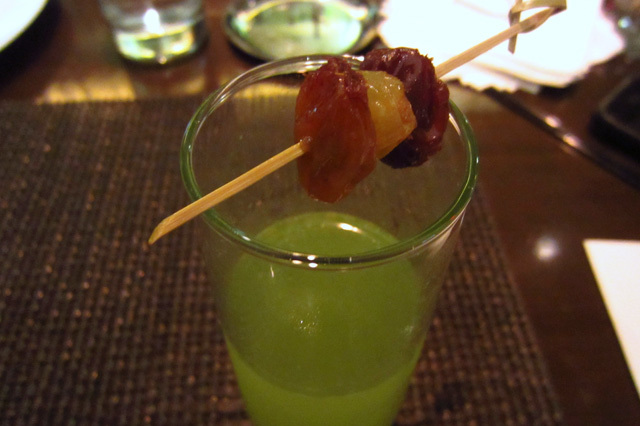 Don’t forget to nibble on the addictive rum-soaked raisins that garnish the Autumn’s Deluge. 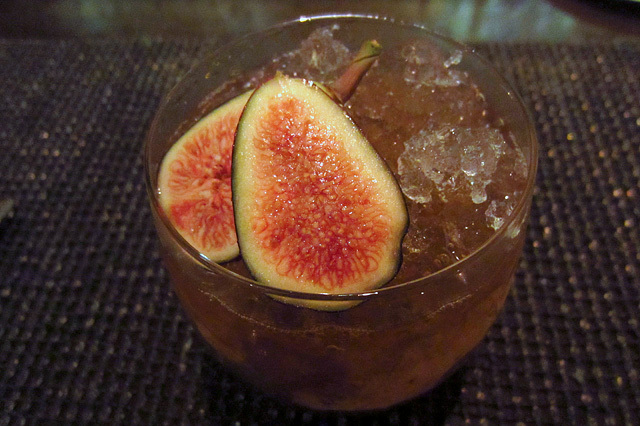 The Break Maiden is a fantastic variation on a Mint Julep, made with Larceny Bourbon, Byrrh, fig shrub and mint. Fueled by the 92-proof Larceny (Heaven Hill’s newest release) and fortified with Byrrh (the wine-based French apéritif), the Break Maiden is a standout of the fall menu. Mandeville said her college roommate was Scottish, so she became accustomed to drinking tea and cream. Her adult version is named Through the Looking Glass: Oxley Gin, Cardamaro, Earl Grey tea, sugar beet syrup, citric acid, cream, nutmeg. Like a bitter, spiked tea with autumnal notes, the Through the Looking Glass is enjoyable, but don’t slack when sipping; that creamy topping doesn’t do well as it warms up. With a name that gives a shout out to Camp Runamok, the Campfire Dawn features Pierde Almas La Puritita Verda mezcal, Clear Creek Douglas Fir eau de vie, sugar, Scrappy’s Lime Bitters and Fee Bros. mint bitters. The soft, approachable Pierde Almas brings a subtle hint of smoke, while the unique Douglas Fir evokes the woods of the Bardstown campgrounds. You can practically hear the strains of Kumbaya. 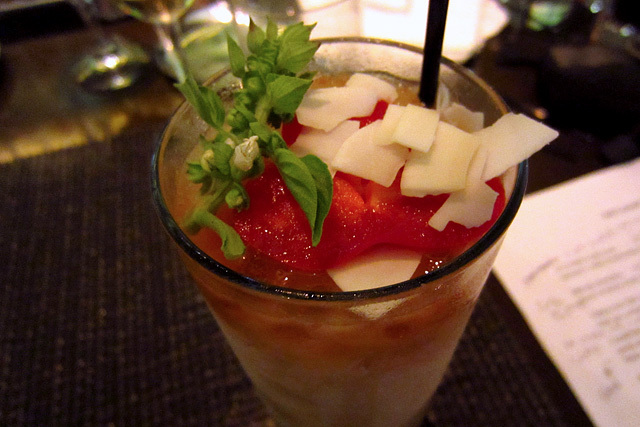 The Indochina Tí is a spicy, Thai-influenced Tiki drink with Smith & Cross Rum, coconut milk, serrano date syrup, red bell pepper, lime, thai basil, Angostura Bitters. Next was Mandeville’s take on the classic Trilby Cocktail, the Savoy Rouge: Bank Note Blended Scotch, Crème Yvette, housemade rose vermouth, Regan’s Orange Bitters and Cocktail Kingdom Wormwood Bitters. 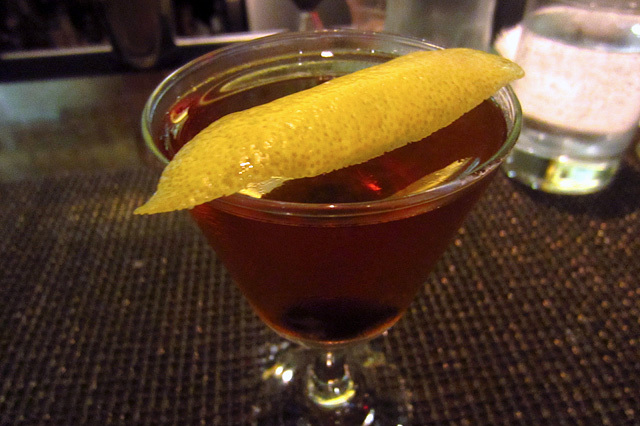 Mandeville went through several iterations before arriving at the final version of her dry, herbaceous vermouth. The Wormwood Bitters lend a particular holiday spice profile to the Savoy Rouge, an ideal cocktail for the crisp fall nights that will arrive any day now. 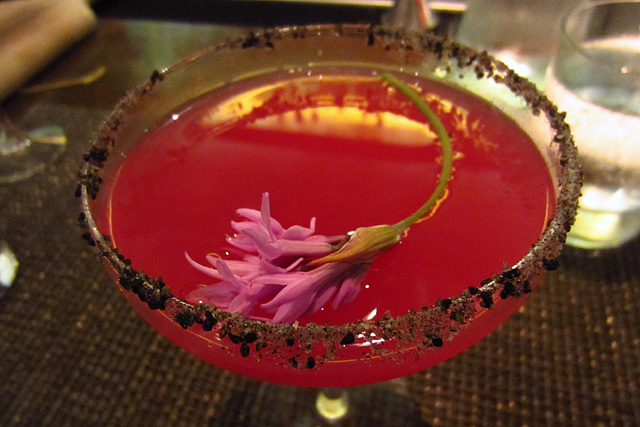 The brilliantly-colored Paraiso is made with Tapatio Blanco tequila, prickly pear cactus, cardamom-infused honey, chives, lime, orange blossom water, rimmed with nigella seeds and sea salt. It’s back to Kentucky for the American Hillbilly: Bulleit Rye, pancetta rosemary-infused maple syrup, Baked Apple Bitters, Miracle Mile Forbidden Bitters and lemon. 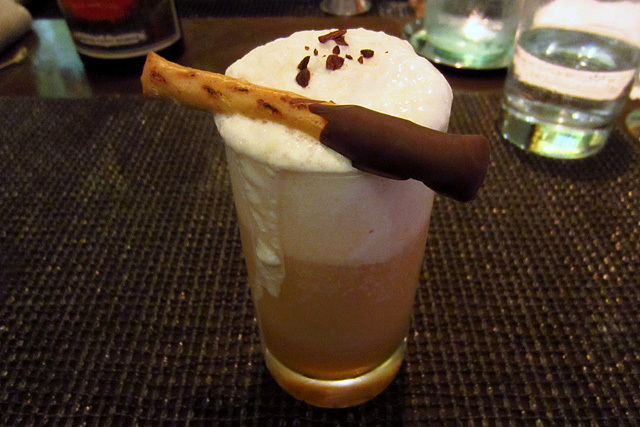 Mandeville uses pancetta to introduce bacon flavor into the cocktail without the usual fallback. 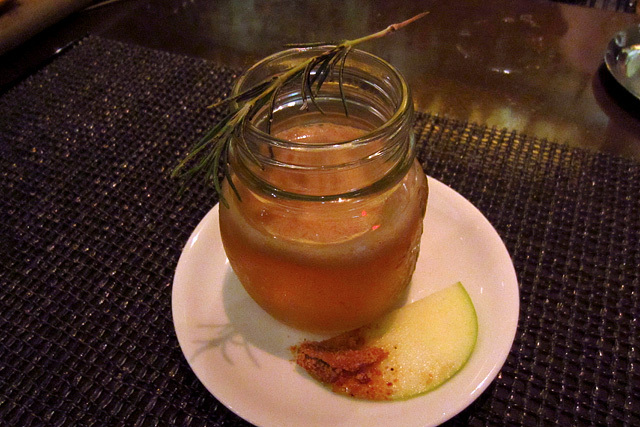 A torched rosemary garnish offers upfront fall notes, while the estimable Forbidden Bitters works its magic to add depth to this savory cocktail. The tasting finished with the Long For Yesterday: Pink Pigeon rum, Tempus Fugit Crème de Cacao, Bitter Truth Xocolatl Mole Bitters, espelette syrup, cream and soda. 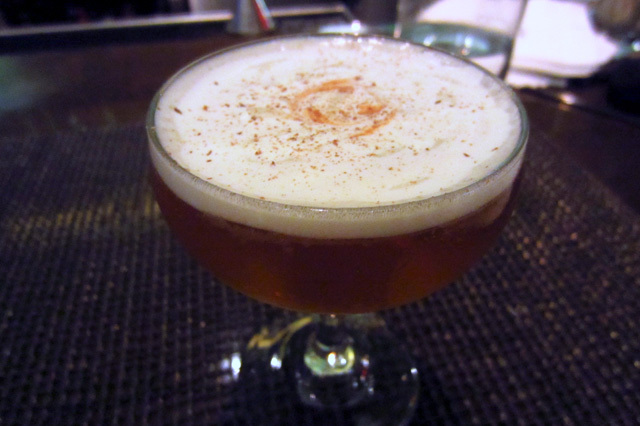 The Long For Yesterday is an excellent, playful interpretation of a Brooklyn egg cream, with the top notch Tempus Fugit offering proper bitter chocolate flavor without being cloyingly sweet. At the tasting, Mandeville said she was still working on the smoke-infused ice for the Rosie Carver, which will have to wait for another day. Along with Lillet Rose, the Rosie Carver features two new releases from The 86 Company, Fords Gin and Aylesbury Duck Vodka.